We investigated the roles of IFN regulatory factor (IRF)-3 and IRF-7 in innate antiviral immunity against dengue virus (DENV). Double-deficient Irf-3−/−7−/− mice infected with the DENV2 strain S221 possessed 1,000–150,000 fold higher levels of viral RNA than wild-type and single-deficient mice 24 h postinfection (hpi); however, they remained resistant to lethal infection. IFN-α/β was induced similarly in wild-type and Irf-3−/− mice post–DENV infection, whereas in the Irf-7−/− and Irf-3−/−7−/− mice, significantly low levels of IFN-α/β expression was observed within 24 hpi. IFN-stimulated gene induction was also delayed in Irf-3−/−7−/− mice relative to wild-type and single-deficient mice. In particular, Cxcl10 and Ifnα2 were rapidly induced independently of both IRF-3 and IRF-7 in the Irf-3−/−7−/− mice with DENV infection. Higher levels of serum IFN-γ, IL-6, CXCL10, IL-8, IL-12 p70, and TNF were also observed in Irf-3−/−7−/− mice 24 hpi, at which time point viral titers peaked and started to be cleared. Ab-mediated blockade experiments revealed that IFN-γ, CXCL10, and CXCR3 function to restrict DENV replication in Irf-3−/−7−/− mice. Additionally, the IFN-stimulated genes Cxcl10, Ifit1, Ifit3, and Mx2 can be induced via an IRF-3– and IRF-7–independent pathway that does not involve IFN-γ signaling for protection against DENV. Collectively, these results demonstrate that IRF-3 and IRF-7 are redundant, albeit IRF-7 plays a more important role than IRF-3 in inducing the initial IFN-α/β response; only the combined actions of IRF-3 and IRF-7 are necessary for efficient control of early DENV infection; and the late, IRF-3– and IRF-7–independent pathway contributes to anti-DENV immunity. Dengue virus (DENV) is a mosquito-borne pathogen that poses a serious threat in the tropical and subtropical regions of the world. Infection with one of the four serotypes of DENV (DENV1–4) causes extensive morbidity and mortality. Approximately 400 million people are infected each year, and 2.5 billion people are at risk for infection in endemic areas, mainly in Southeast Asia, the Pacific, and the Americas (1). The clinical manifestations of DENV infection range from mild febrile illness to severe symptoms including dengue hemorrhagic fever and dengue shock syndrome (2). Currently, there is no licensed vaccine or antiviral treatment available for DENV (3). Despite the significant prevalence of DENV worldwide, the virus–host interactions that determine the viral pathogenesis remain unclear. The short-course and self-limiting febrile symptom observed in most DENV-contracted cases suggest a key role of innate immune defenses in controlling DENV infection at the early stage. Among the intrinsic antiviral factors of the host, IFNs are involved in numerous initial responses against viral infections. Accordingly, studies with experimental DENV infection in mice have demonstrated a critical role for both type I and II IFNs in the host defense against DENV (4, 5). In particular, double-deficient 129/Sv mice lacking type I and II IFN receptors (AG129 mice) (6, 7), STAT1 and STAT2 (STAT1−/−/2−/− mice) (8, 9), or STAT1 and type I IFN receptor (STAT1−/−/IFNAR−/−) are highly sensitive to DENV infection and disease (9). Single-deficient 129/Sv or C57BL/6 mice lacking type I IFN receptor (A129 or AB6 mice) are also sensitive to DENV infection, albeit they develop disease upon higher viral challenge doses than those required for the double-deficient animals lacking components of both type I and II IFN receptor signaling (6, 10). In contrast, single-deficient mice lacking type II IFN receptor have a nearly normal resistance to DENV infection and disease (4, 5), highlighting the critical role of type I IFN receptor signaling in host defense against DENV. Type I IFN responses against DENV are triggered through the viral RNA binding of pattern-recognition receptors (RIG-I/MDA5) and downstream MAVS/IPS-1/VISA/Cardif-dependent signaling in cultured fibroblasts (11). Consistent with this study, we observed a delayed type I IFN production in MAVS−/− mice infected with the DENV2 strain S221, indicating that MAVS regulates the initial type I IFN response during DENV infection (10). Previously in this murine model of experimental DENV infection, we have shown that the early, highly efficient type I IFN response requires the combined action of STAT1 and STAT2, and each STAT pathway can function independently to induce type I IFNs and limit viral replication later in infection (9). At present, the signaling mechanisms that are downstream of MAVS but upstream of STAT1 or STAT2 for the induction of type I IFN responses against DENV are as yet to be defined. IFN regulatory factors (IRF) 3 and 7 are primary transcriptional factors downstream of MAVS signaling and regulate the type I IFN response after RNA virus infections (12, 13). In this study, we therefore investigated the roles of IRF-3 and IRF-7 in innate host immunity against DENV. Mice deficient in IRF-3, IRF-7, or both IRF-3 and IRF-7 were infected with the DENV2 strain S221 and examined at the virologic and immunologic level. We observe that efficient early control of viral replication requires the combined action of IRF-3 and IRF-7. However, each pathway can function independently to limit the initial viral replication. Moreover, even the combined absence of IRF-3 and IRF-7 is not sufficient to induce disease, revealing a role for the IRF-3– and IRF-7–independent pathway in innate antiviral immunity against DENV. C6/36 cells (Aedes albopictus mosquito cells) were maintained in Leibovitz’s L15 medium (Invitrogen, Carlsbad, CA) supplemented with 10% FBS (Gemini Bio Products, Woodland, CA), penicillin, streptomycin, and HEPES (all from Invitrogen) at 28°C in the absence of CO2. S221 is a plaque-purified virus strain derived from the Taiwanese DENV2 clinical isolate PL046 (obtained from Dr. Huan-Yao Lei, National Cheng Kung University, Taiwan). The virus was propagated in C6/36 cells and quantified based on genomic equivalent (GE) by real-time RT-PCR as previously described (14). There are ∼5 × 104 GE per PFU for a fixed batch of S221 used throughout this study, based on a plaque assay on baby hamster kidney cells. C57BL/6 mice were purchased from The Jackson Laboratory (Bar Harbor, ME). Irf-3−/−, Irf-7−/−, and Irf-3−/−7−/− breeder mice were provided by Dr. Tadatsugu Taniguchi (The University of Tokyo) via Dr. Michael Diamond (Washington University). IFNAR−/− mice were obtained from Dr. Wayne Yokoyama (Washington University, St. Louis, MO) via Dr. Carl Ware (La Jolla Institute for Allergy and Immunology). All knockout mice are on the C57BL/6 genetic background. Mice were infected i.v. with 1011 GE DENV S221. All mice experiments were approved by the Animal Care Committee at La Jolla Institute for Allergy and Immunology. Mice were euthanized via isoflurane inhalation at different time points postinfection and subsequently perfused with 30 ml PBS. Blood was collected via cardiac puncture, and viral RNA in serum was extracted using the QIAamp viral RNA Mini kit (Qiagen). Tissues were harvested into RNAlater (Qiagen) and homogenized in RLT lysis buffer (Qiagen) for 3 min using Tissuelyser (Qiagen) according to the manufacturer’s instruction. Total RNA in tissues was extracted using the RNeasy Mini kit (Qiagen). Extracted RNA was stored at −80°C until analysis. Quantitative RT-PCR (qRT-PCR) of DENV viral RNA in serum and tissues was performed as previously described (14). A standard curve was generated with known concentrations of DENV2 or 18S RNA. Virus titers in serum were expressed as the log10 DENV2 GE per milliliter, and those in tissues were expressed as log10 DENV2 GE relative to 18S. Plaque assays of virus in serum samples were performed as previously described (7). Quantitation of IFN-α and -β RNA was performed by qRT-PCR using previously described primers and probes (15). Mice were sacrificed with isoflurane inhalation and perfused with 30 ml PBS. Spleens were embedded in OCT compound (Sakura, Torrance, CA) and stored at −80°C. Cryosections (6 μm) were cut and fixed for 10 min in acetone, followed by 8 min in 1% paraformaldehyde (EMS, Hatfield, PA) in 100 mM dibasic sodium phosphate containing 60 mM lysine and 7 mM sodium periodate (pH 7.4) at 4°C. Sections were blocked by 5% normal goat serum (Invitrogen) in PBS for 10 min and stained with affinity-purified rabbit polyclonal anti-DENV NS3 Ab (obtained from Novartis Institute for Tropical Diseases, Singapore) for 4 h at room temperature. After washes, sections were stained with Dylight 649 labeled goat anti-rabbit IgG (Jackson ImmunoResearch Laboratories, West Grove, PA) for 1 h. Nuclei were counterstained using DAPI (Invitrogen). Serum levels of type I IFN were analyzed using the VeriKine Mouse IFN α ELISA Kit and Mouse IFN β ELISA Kit (PBL InterferonSource, Piscataway, NJ). The IFN-α ELISA kit detects all subtypes of IFN-α according to the manufacturer. Serum levels of type III IFN (IFN λ) were examined by Mouse IL-28 Platinum ELISA (eBioscience, San Diego, CA). Serum levels of CXCL10 were measured by Mouse IP-10 Platinum ELISA (eBioscience), and other cytokines (IL-1β, IL-12p70, IFN-γ, IL-6, IL-8, IL-10, and TNF) were measured by the Mouse Proinflammatory 7-Plex Ultra-Sensitive Kit (Meso Scale Discovery, Gaithersburg, MD). All of the ELISA procedures were performed according to the manufacturers’ instructions. An RT2 profiler Type I IFN Response PCR Array (PAMM-016/PAMM-016Z; SABioscience) was performed following the manufacturer’s protocol. Briefly, splenic RNA was purified from spleens as described above and quantitated using spectrometry. To avoid the contaminations of genomic DNA, 1 mg splenic RNA was treated with 0.5 U DNase (Invitrogen) for 15 min at room temperature and then 8 min at 70°C to inactivate the DNase. cDNA was synthesized using the RT2 First Strand kit (SABioscience) and then loaded onto the 384-well PCR array plate for amplification on the LightCycler 480 PCR system (Roche). PAMM-016Z is an updated version kit of PAMM-016. A list of 55 genes that are in common between two versions of kit is provided in Supplemental Table I. Data were analyzed using the online software provided by SABioscience (http://www.sabiosciences.com/pcr/arrayanalysis.php). A dose of 0.5 mg functional-grade (azide-free, sterile-filtered, and with endotoxin levels of <2.0 EU/mg) anti-mouse IFN-γ Ab (5) (clone XMG1.2), anti-mouse IL-6 Ab (6) (clone MP5-20F3), or isotype-matched control Abs (all from BioXCell, West Lebanon, NH) was administered i.p. to Irf-3−/−7−/− mice on days −1, 0, 1, and 2 postinfection. A dose of 0.2 mg functional-grade anti-mouse CXCR3 Ab (16) (clone 173), anti-mouse CXCL10 Ab (17) or isotype-matched controls (BioXCell) was administered i.p. to Irf-3−/−7−/− mice on days −1, 0, and 1 postinfection. Survival was monitored for 30 d after virus infection, and tissue viral load 3 d after virus challenge was measured by qRT-PCR as described above. Data were analyzed by unpaired t tests or ANOVA by Dunnett multiple comparison tests using GraphPad Prism (GraphPad Software). All error bars represent SD. The p values < 0.05 were considered significant. To investigate the contributions of IRF-3 and IRF-7 to the susceptibility of mice to DENV infection, four different strains of mice (wild-type, Irf-3−/−, Irf-7−/−, and Irf-3−/−7−/− mice) were infected with 1 × 1011 or 1 × 1012 GE DENV2 strain S221, and mice were monitored for survival. The results showed all four strains of mice survived the infection through the monitoring period of 30 d (data not shown), unlike mice lacking type I IFN receptor, which develop a lethal disease between days 4 and 7 postinfection with 1012 GE of S221 (10). Thus, neither IRF-3 nor IRF-7 is required for control of lethal DENV infection. To further define how the deficiency of IRF-3 and IRF-7 affects the susceptibility of mice to DENV infection, we measured the virus burden in mice tissues. Fig. 1 shows that increased levels of viremia were detected from Irf-3−/−7−/− mice at 12, 18, 24, and 72 h postinfection (hpi) relative to wild-type mice using plaque assay (78-, 2,630-, 16,218-, and 76-fold more, respectively; p < 0.001) and qRT-PCR (509-, 45,533-, 158,489-, and 2,080-fold higher, respectively; p < 0.001). IFNAR−/− mice exhibited even higher levels of viremia across all time points. In the spleen, higher than wild-type levels of viral RNA were observed from Irf-3−/−7−/− mice at all four time points postinfection (95-, 1093-, 1672-, and 2706-fold higher, respectively; p < 0.001) (Fig. 1B). Among wild-type and IRF single-deficient mice, Irf-7−/− mice have higher levels of DENV RNA in the spleen than wild-type mice (17-, 17-, and 18-fold higher at 12, 18, and 24 hpi, respectively, p < 0.001; 8-fold higher at 72 hpi, p < 0.05). In contrast, Irf-3−/− mice had low, wild-type levels of viral RNA in the spleen. Levels of virus burden in DENV-infected mice. Wild-type (WT), Irf-3−/−, Irf-7−/−, and Irf-3−/−7−/− were infected i.v. with 1011 GE of DENV2 strain S221. Levels of viral RNA in the serum (IFNAR−/− mice included) (A), spleen (B), liver (C), and kidney (D) at 12, 18, 24, and 72 hpi were determined by qRT-PCR. Data were presented as viral GE per milliliter of serum or per copy of 18S rRNA of tissues. Each time point represents 6–10 mice from two independent experiments, with mean ± SD from the replicates, and the limit of detection is denoted by a dotted line. Viral titers between the gene-deficient mice and the WT mice were compared by ANOVA followed by Dunnett multiple comparisons tests. (E) Spleens harvested from mice at 24 hpi were sectioned, fixed, and stained with NS3 Ab (red). Nuclei were counterstained with DAPI (blue). Original magnification ×5. Images are representative of two independent experiments. *p < 0.05, **p < 0.01, ***p < 0.001, ****p < 0.0001. 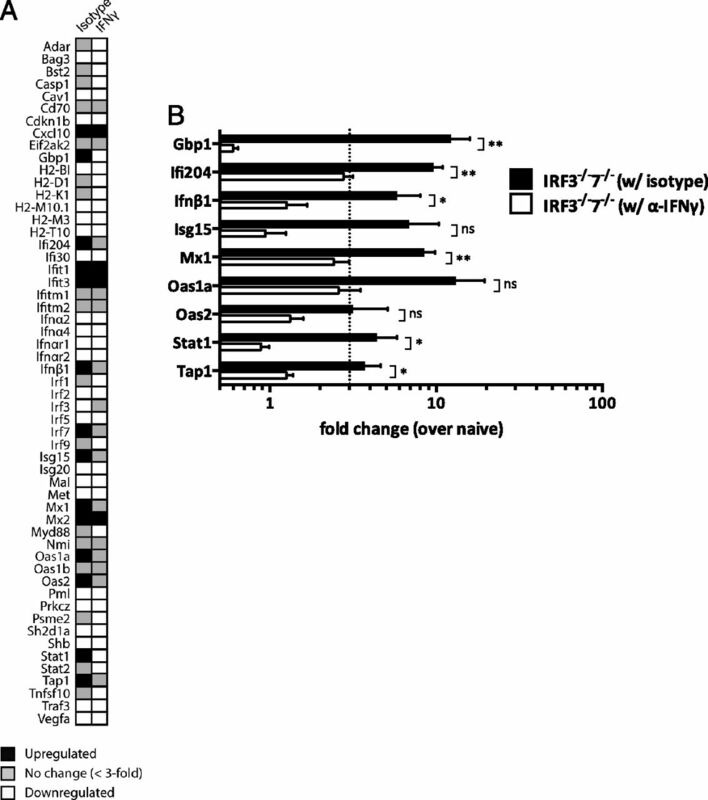 In the livers of infected Irf-3−/−7−/− mice, viral RNA levels increased significantly starting at 18 hpi (131-, 1148-, and 17-fold higher than wild-type mice at 18, 24, and 72 h, respectively), whereas the other three strains of mice had low, near the limit of detection, levels of virus (Fig. 1C). Similarly, higher levels of viral RNA were detected in the kidneys of Irf-3−/−7−/− mice as compared with wild-type and single-deficient mice (18-, 1820-, and 260-fold higher than wild-type mice at 18, 24, and 72 h, respectively) (Fig. 1D). We also confirmed viral replication in the spleen, the initial target tissue of DENV in this mouse model, using immunohistochemistry. Viral NS3 protein was readily detected at 24 hpi in the splenic marginal zones of Irf-3−/−7−/− mice (Fig. 1E). In agreement with the qRT-PCR data shown in Fig. 1B, few NS3-expressing cells in Irf-7−/− and no NS3-positive cells in wild-type and Irf-3−/− spleens were detected. Similar results were observed at 12 hpi (data not shown). Taken together, these data demonstrate that IRF-3 and IRF-7, either individually or together, are dispensable to preventing lethal DENV infection. However, IRF-3 and IRF-7, in combination, control viral infection in multiple tissues, with IRF-7 playing a slightly more important role than IRF-3 in restricting viral replication in the spleen. As IRF-3 and IRF-7 regulate type I IFN production during viral infections, we next examined type I IFN expression at the protein and mRNA level in the infected mice. Serum IFN-α levels in wild-type and Irf-3−/− mice were elevated, starting at 6 hpi, peaked at 12 hpi, and lasted through 24 h, dropping back to the baseline at 72 hpi (Fig. 2A). 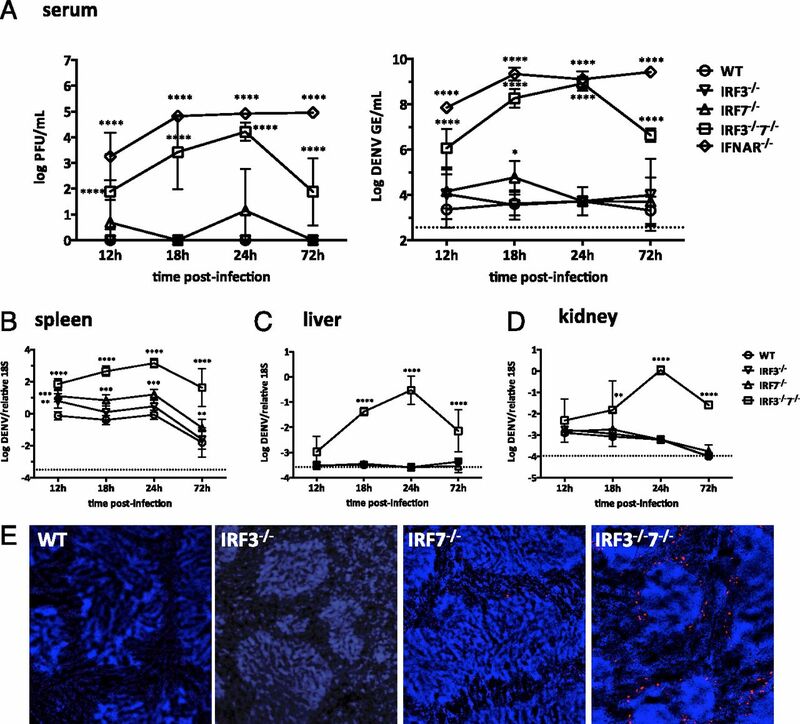 However, a significantly diminished but not abrogated serum IFN-α response was observed in Irf-7−/− mice during 6–24 hpi as compared with wild-type or Irf-3−/− mice (Fig. 2A). Similarly, a reduced level of serum IFN-β was found in Irf-7−/− mice (Fig. 2B). These data indicate that IRF-7 contributes to the initial stage (0–6 hpi) of type I IFN production, and in the absence of IRF-7, an IRF-7–independent mechanism (likely IRF-3) compensates at the later stage (6–12 hpi) to achieve a partial IFN response. Compared to the single-deficient mice, neither IFN-α nor IFN-β was detected above the naive mouse levels in the serum of the double-deficient mice. The dramatic loss of type I IFN secretion in the serum due to the combined absence of IRF-3 and IRF-7 indicates that IRF-3 and IRF-7, together, are the major regulators of type I IFN production during DENV infection. Type I IFN expression in response to DENV infection in mice. Wild-type (WT), Irf-3−/−, Irf-7−/−, and Irf-3−/−7−/− mice were infected i.v. with 1011 GE of DENV2 strain S221. (A and B) Sera from mice were collected at 0, 6, 12, 18, 24, and 72 hpi and analyzed for IFN-α and IFN-β by ELISA. Each time point represents 5–10 mice from two independent experiments, with mean ± SD from the replicates, and the limit of detection is denoted by a dotted line. Serum levels of IFN-α and IFN-β were compared by ANOVA followed by Dunnett multiple comparisons tests. (C and D) Total RNA was extracted from spleens of WT and Irf-3−/−7−/− mice. Levels of IFN-α and IFN-β mRNA were determined by qRT-PCR and normalized to 18S rRNA of the spleens. Each time point represents 6–10 mice from two independent experiments, with mean ± SD from the replicates. Expression levels of IFN-α and IFN-β were compared by unpaired t tests. *p < 0.05, **p < 0.01, ***p < 0.001, ****p < 0.0001. To further dissect the expression profile of IFN-α/β, we next investigated the splenic type I IFN response at the transcriptional level by qRT-PCR and obtained the relative IFN-α and IFN-β mRNA expression levels in infected animals over naive mice. We observed a significantly lower level of IFN-α mRNA in Irf-3−/−7−/− mice (0.83-fold) at 12 hpi relative to wild-type mice (2.44-fold; p < 0.01) (Fig. 2C). A gradual increase in the IFN-α mRNA expression level was observed during 18–72 hpi. A similar expression pattern of IFN-β mRNA was observed (Fig. 2D). These data suggest that low levels of splenic type I IFN mRNA expression are induced in a delayed manner in the absence of IRF-3 and IRF-7 in mice with DENV infection. To further identify the antiviral genes that are controlled by IRF-3 and IRF-7 signaling during DENV infection, we next examined a panel of IFN-stimulated gene (ISG) expression in the spleens of wild-type, Irf-3−/−, Irf-7−/−, and Irf-3−/−7−/− mice at 12 or 24 h after DENV infection using a quantitative PCR array kit. The fold changes in expression of 55 genes from infected mice were normalized to that of strain-matched naive mice. At 12 hpi, 28 (50.9%), 31 (56.4%), and 31 (56.4%) of the genes were induced >3-fold over naive in wild-type, Irf-3−/−, and Irf-7−/− mice, respectively, whereas only 2 (3.6%) of the 55 genes were induced >3-fold over naive in Irf-3−/−7−/− mice (Fig. 3A, left panel). By 24 hpi, 22 (40%), 16 (29.1%), 13 (23.6%), and 21 (38.2%) genes were induced more than 3-fold over naive in wild-type, Irf-3−/−, Irf-7−/−, and Irf-3−/−7−/− mice, respectively (Fig. 3A, right panel). Overall, most ISGs were rapidly induced at 12 hpi, except in Irf-3−/−7−/− mice, which showed a delayed ISG expression until 24 hpi. More than 95% of genes induced at the later time point (24 hpi) overlapped those induced at the early time point (12 hpi) in wild-type, Irf-3−/−, and Irf-7−/− mice. Although Irf-7−/− mice showed similar numbers of upregulated ISGs as wild-type and Irf-3−/− mice at 12 hpi, five genes (Ifnα2, Ifnα4, Ifnβ1, Oas1a, and Oas2) were induced to a lower level in Irf-7−/− mice relative to wild-type or Irf-3−/− mice (Fig. 3B), suggesting that IRF-7 plays a more important role than IRF-3 in inducing robust expression of these particular five genes at the early stage of DENV infection. Comparison of ISG induction in DENV-infected mice. Wild-type (WT), Irf-3−/−, Irf-7−/−, and Irf-3−/−7−/− mice were infected i.v. with 1011 GE of DENV2 strain S221. (A) ISG expression in spleens from each strain of mice was evaluated using RT2 profiler Type I IFN Response PCR Array at 12 and 24 hpi. Gene expression of transcripts with a difference of ≥3-fold over naive was illustrated (black, upregulated; gray, no change; white, downregulated). (B) Gene induction in the spleens of WT, Irf-3−/−, and, Irf-7−/− mice was expressed as fold-increase over naive for each strain of mice at 12 hpi. Fold change was compared by ANOVA followed by Dunnett multiple comparisons tests. (C) Gene induction in the spleens of WT and Irf-3−/−7−/− mice was expressed as fold-increase over naive for each strain of mice at 12 or 24 hpi and compared by unpaired t tests. Dotted lines denote 3-fold change over strain-matched naive mice. Data represent mean fold-change of three mice per strain at each time point. *p < 0.05, **p < 0.01, ***p < 0.001, ****p < 0.0001. In addition, upregulation of Bst2, H2-T10, Ifnα4, Isg20, Myd88, Nmi, and Oas1b was observed in Irf-3−/− and Irf-7−/− mice, but not in Irf-3−/−7−/− mice at both time points, indicating these genes may be regulated via an IRF-3– or IRF-7–dependent mechanism. The two genes, Cxcl10 (3.36-fold higher relative to naive mice) and Ifnα2 (3.32-fold higher relative to naive mice) that were slightly upregulated in Irf-3−/−7−/− mice at 12 hpi, represent the ISGs that were induced early and independently of both IRF-3 and IRF-7 in response to DENV infection. 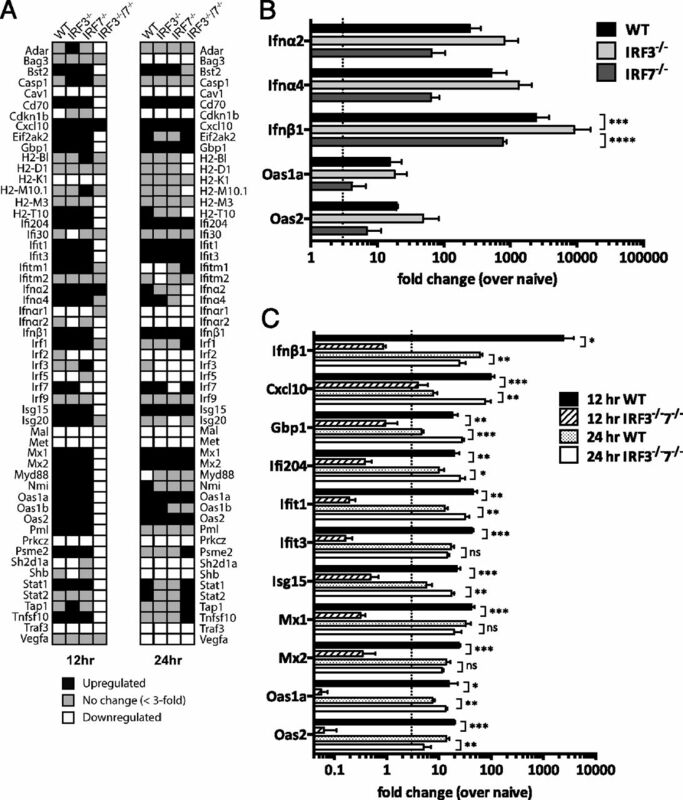 By 24 h postinfection (hpi), a total of 21 ISGs were induced in Irf-3−/−7−/− mice, 13 of which showed even higher fold change in Irf-3−/−7−/− than wild-type mice (Supplemental Table I), revealing the presence of a robust ISG response in the double-deficient mice at a later stage of DENV infection through an IRF-3– and IRF-7–independent pathway. Fig. 3C summarizes the fold changes in 11 genes between wild-type and Irf-3−/−7−/− mice at both time points. Thus far, our studies have shown that, in the combined absence of IRF-3 and IRF-7, type I IFN and ISG expression are induced at a later stage of DENV infection, and this delayed IFN and ISG response is highly effective in mediating viral clearance and preventing lethal disease. These findings reveal an important contribution of the IRF-3– and IRF-7–independent pathway in innate antiviral immunity to DENV. To start understanding the nature of this pathway, serum levels of innate inflammatory cytokines/chemokines in S221-infected wild-type versus Irf-3−/−7−/− mice were examined. Although type III IFN was undetectable in the serum of all infected mice (data not shown), Irf-3−/−7−/− mice had significantly higher than wild-type levels of IFN-γ (1320-fold; p < 0.01), IL-6 (27.6-fold; p < 0.01), and CXCL10 (2.6-fold; p < 0.01) 24 hpi (Fig. 4A–C), when virus replication peaked and started to be cleared as shown in Fig. 1. Similarly, IL-8, IL-12 p70, and TNF were also elevated by 7.1- (p < 0.01), 137- (p < 0.001), and 47.8-fold (p < 0.01), respectively, in Irf-3−/−7−/− mice relative to wild-type animals at the 24-h time point (Supplemental Fig. 1A–C). By 72 hpi in Irf-3−/−7−/− mice, serum levels of all six cytokines decreased, but serum IFN-γ, IL-6, CXCL10, and IL-8 levels remained significantly high compared with wild-type mice (p < 0.05). These data suggest that these cytokines/chemokines may contribute to the control of virus replication in Irf-3−/−7−/− mice. High levels of circulating cytokines/chemokine in Irf-3−/−7−/− mice during the viral clearance stage. Wild-type (WT) and Irf-3−/−7−/− mice were infected i.v. with 1011 GE of DENV2 strain S221. Levels of IFN-γ (A), IL-6 (B), and CXCL10 (C) in the serum of DENV-infected WT and Irf-3−/−7−/− mice at 12, 24, 18, and 72 hpi were detected by ELISA. Each time point represents six to eight mice from two independent experiments, with mean ± SD from the replicates, and the limit of detection is denoted by a dotted line. Data between two groups of mice were compared by unpaired t tests. *p < 0.05, **p < 0.01. Our published studies comparing the phenotype of DENV-infected mice lacking type I IFN receptor alone versus mice lacking both type I and II IFN receptors have demonstrated a critical role for IFN-γ receptor signaling in protection against DENV infection and disease (4, 5). Therefore, we next evaluated the contribution of IFN-γ to the anti-DENV immunity in Irf-3−/−7−/− mice. For this purpose, Irf-3−/−7−/− mice were administered neutralizing Abs against IFN-γ, IFN-γ–induced molecule CXCL10, CXCR3 (CXCL10 receptor), or IL-6 (for comparison as a molecule not likely to be directly involved in the IFN-γ antiviral pathway), followed by challenge with 1011 GE of S221. At this viral challenge dose, mice lacking type I and II IFN receptors in either 129/Sv or C57BL/6 background develop an early lethal disease 4–6 d postinfection (5, 9). A total of 100% of Irf-3−/−7−/− mice treated with blocking Ab against IFN-γ, CXCL10, or IL-6 activity survived DENV challenge (data not shown). However, neutralization of IFN-γ activity in Irf-3−/−7−/− mice resulted in a significant increase in viral RNA levels in all tissues examined (serum, liver, kidney, and spleen; p < 0.001) relative to isotype control Ab-treated mice. The lack of IL-6 activity, which shares the same isotype control Ab with IFN-γ, did not lead to a difference in tissue viral RNA levels (Fig. 5A). Blockade of CXCL10 activity and CXCL10 receptor CXCR3 resulted in higher viral RNA levels than isotype-treated mice in the serum (Fig. 5B). Moreover, a significant decrease in serum CXCL10 level was observed in IFN-γ–neutralized Irf-3−/−7−/− mice relative to isotype control Ab–treated Irf-3−/−7−/− mice (p < 0.05) (Fig. 5C), revealing that some CXCL10 was directly induced by IFN-γ and involved in the IFN-γ–mediated virus control. These data show that IFN-γ, CXCL10, CXCR3, but not IL-6, contribute to DENV restriction in tissues of Irf-3−/−7−/− mice. However, neutralization of IFN-γ, CXCL10, or CXCR3 activity had no impact in the survival phenotype of Irf-3−/−7−/− mice upon DENV challenge, providing further supporting an important role for the IRF-3– and IRF-7–independent mechanism in the host defense against DENV. Blockade of cytokines/chemokines in DENV2-infected Irf-3−/−7−/− mice. Irf-3−/−7−/− mice were infected i.v. with 1011 GE of DENV2 strain S221. Viral RNA levels in serum and tissues of Irf-3−/−7−/− mice, in which neutralizing Abs against IFN-γ, IL-6, or isotype control (n = 3–10) (A) or CXCR3, CXCL10, or isotype control were administrated (n = 6–12) (B), were determined 72 hpi. Data represent two independent experiments. Viral RNA levels were compared by ANOVA followed by Dunnett multiple comparisons tests. Bars indicate geometric means. (C) Serum CXCL10 from anti–IFN-γ–treated or isotype control Ab–treated Irf-3−/−7−/− mice at 72 hpi was detected by ELISA and compared by unpaired t test. The limit of detection is denoted by a dotted line. *p < 0.05, **p < 0.01, ***p < 0.001, ****p < 0.0001. To identify the ISGs that may be involved in the IRF-3– and IRF-7–independent signaling against DENV, ISG response was evaluated by PCR array in IFN-γ–neutralized Irf-3−/−7−/− mice 24 hpi (Supplemental Table II). Among the 55 genes examined, 14 genes were upregulated >3-fold over naive in the isotype control Ab-treated Irf-3−/−7−/− mice, whereas only 4 genes (Cxcl10, Ifit1, Ifit3, and Mx2; p < 0.01) were upregulated in the IFN-γ–neutralized Irf-3−/−7−/− mice (Fig. 6A). Fig. 6B summarizes the fold changes of genes comparing control and IFN-γ–neutralized Irf-3−/−7−/− mice. Thus, the 10 genes that were not activated in IFN-γ–neutralized Irf-3−/−7−/− mice represent the ISGs induced by the IFN-γ pathway. In contrast, the four genes that were upregulated in IFN-γ–neutralized Irf-3−/−7−/− mice can potentially function in the absence of IRF-3, IRF-7, and IFN-γ, thereby identifying Cxcl10, Ifit1, Ifit3, and Mx2 as the ISGs that can be induced via the IRF-3– and IRF-7–independent pathway during DENV infection in mice. Comparison of ISG induction in DENV2-infected Irf-3−/−7−/− mice. Irf-3−/−7−/− mice were infected i.v. with 1011 GE of DENV2 strain S221. ISG induction in spleens from anti–IFN-γ– or isotype control Ab–treated Irf-3−/−7−/− mice was evaluated using RT2 profiler Type I IFN Response PCR Array at 24 hpi. (A) Gene expression of transcripts with a difference in expression of ≥3-fold over naive was illustrated (black, upregulated; gray no change; white, downregulated). (B) Gene induction in the spleens anti–IFN-γ– or isotype control Ab–treated Irf-3−/−7−/− mice was expressed as fold-increase over naive. Data represent mean fold-change of three mice per strain. The dotted line denotes 3-fold change over naive mice. Data between anti–IFN-γ– or isotype control Ab-treated Irf-3−/−7−/− mice were compared by unpaired t tests. *p < 0.05, **p < 0.01. IRF-3 and IRF-7 are master transcriptional factors that regulate type I IFN gene (IFN-α/β) induction and innate immune defense after virus infection. In this study, we investigated the role of IRF-3 and IRF-7 for antiviral innate immunity to DENV using IRF-3– and/or IRF-7–deficient mice. The viral replication kinetics in the infected mice was linked to the patterns of type I IFN induction, ISG expression, and cytokine/chemokine secretion to determine the contributions of IRF-3 and IRF-7 to anti-DENV innate immunity. The results demonstrated that IRF-7 played an essential, nonredundant role in mediating the initial type I IFN response and that IRF-3 and IRF-7 played a compensatory, redundant role in inducing the type I IFN response at a later phase of DENV infection. Additionally, the resistance of IFN-γ–neutralized Irf-3−/−7−/− mice to DENV-induced lethal disease revealed a critical role for the IRF-3– and IRF-7–independent pathway that does not involve IFN-γ signaling in the host defense against DENV. Based on Irf-7−/− mice exhibiting slower viral clearance, reduced levels of type I IFN response, and lower transcriptional signals of ISGs as compared with wild-type or Irf-3−/− mice upon DENV challenge, we conclude that IRF-7 is required for mounting the initial type I IFN response as early as 6 h after DENV infection. Although IRF-3 is not required for this initial type I IFN response, it plays an important role in inducing a robust antiviral response in the early phase, as the combined absence of IRF-3 and IRF-7 leads to higher viral burden in the spleen than the absence of IRF-7 alone. At a later phase of infection, IRF-3 and IRF-7 compensate the absence of each other and thus only the combined loss of both IRF-3 and IRF-7 results in impaired viral restriction and delayed viral clearance. In this mouse model of DENV infection, DENV replicates in the spleen first, followed by replication in other lymphoid tissues, and finally in nonlymphoid tissues (18). Therefore, besides the temporal aspect of IRF-3 and IRF-7 action, the presence of higher than wild-type or IRF-3–deficient levels of viral RNA in the spleen of Irf-7−/− mice at both early and late time points postinfection suggest that IRF-7 may play a more important role in lymphoid than nonlymphoid tissues during the host response to DENV. Consistent with previous studies of encephalomyocarditis virus, HSV, vesicular stomatitis virus (19), and a related flavivirus, West Nile (WNV) virus (15), Irf-3−/− mice in this study showed a nearly normal type I IFN response after DENV infection. In contrast, a deficiency of IRF-7 resulted in blunted type I IFN production, decreased ISG response, and increased viral burden in Irf-7−/− mice, also in agreement with the findings in WNV (20). Furthermore, the blunted systemic type I response and delayed but not abrogated transcriptional signals of IFN-β observed in DENV-infected Irf-3−/−7−/− mice paralleled the findings from WNV-infected Irf-3−/−7−/− mice and primary macrophages (a physiologically relevant target cells for DENV). Therefore, the early protective IFN-α/β response against DENV occurs through IRF-7 signaling. Based on our previous study demonstrating the MAVS pathway is responsible for the initial type I IFN response to DENV in this mouse model (10), we conclude that the initial innate antiviral response to DENV is mediated by MAVS and IRF-7 signaling downstream of MAVS. At a later phase of infection in Irf-3−/−7−/− mice, the type I IFN and ISG responses in the spleen were restored, and virus replication was controlled through the combination of the IFN-γ and IRF-3/7–independent pathways. Profiling of the ISG and chemokine/cytokine responses in DENV-infected wild-type versus Irf-3−/−7−/− mice revealed CXCL10 as a key molecule that may be involved in antiviral responses mediated by both the IFN-γ and IRF-3/7–independent pathways. 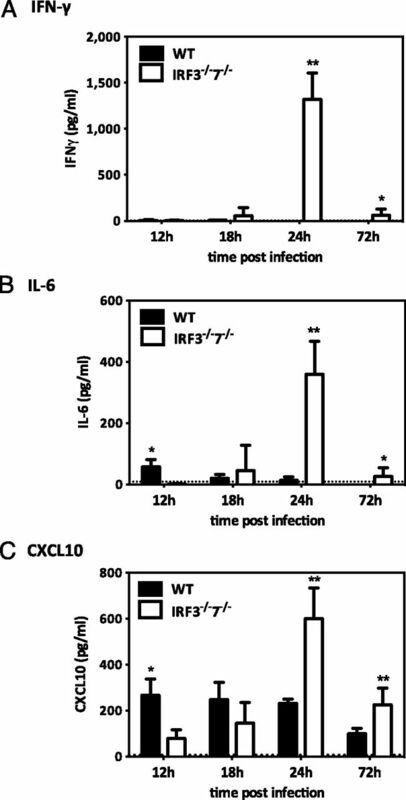 Indeed, neutralization of IFN-γ activity in Irf-3−/−7−/− mice resulted in reduced but not absent levels of CXCL10, and CXCL10 or CXCR3 blockade led to increased viral burden in Irf-3−/−7−/− mice. A published study using CXCL10−/− and CXCR3−/− mice has demonstrated an important role for CXCR3 and CXCL10 in protection against paralytic disease induced by intracerebral DENV inoculation (21). In contrast in this study, Irf-3−/−7−/− mice with CXCL10 or CXCR3 blockade did not develop the lethal dengue hemorrhagic fever/dengue shock syndrome–like disease that is typically observed in S221-infected mice lacking both type I and II IFN receptors. These results suggest different innate immune mechanisms restrict DENV in neuronal versus nonneuronal tissues. Recent studies with other viral infection models have begun to identify the mechanisms responsible for stimulating the innate antiviral defense independently of IRF-3 and IRF-7. IRF-1, rather than IRF-3 or IRF-7, was shown to be required for IFN-γ– mediated inhibition of MNV replication (22). We also observed an increased level of IRF-1 in Irf-3−/−7−/− mice at 24 hpi, when IFN-γ starts to control DENV replication, suggesting IRF-1 may be responsible for IFN-γ action against DENV. In addition, elevated levels of IFN-γ, IL-6, and TNF were consistent with the finding in chikungunya virus–infected Irf-3−/−7−/− mice at day 2 (23). In the case of WNV, the IFN-β response in myeloid dendritic cells is MAVS dependent but IRF-1, IRF-3, IRF-7, IRF-8, and MyD88 independent (24). Based on the most recent publication reporting that the MAVS-dependent induction of ISGs in WNV-infected mDCs can occur through an IRF-5–dependent pathway in the absence of IRF-3 and IRF-7 (25), IRF-5 is a likely candidate for the IRF-3– and IRF-7–independent signaling against DENV. Collectively, these results demonstrate that IRF-3 and IRF-7 are redundant, albeit IRF-7 plays a more important role than IRF-3 in inducing the initial IFN-α/β response; only the combined actions of IRF-3 and IRF-7 are necessary for efficient control of early DENV infection; and the late, IRF-3– and IRF-7–independent pathway contributes to anti-DENV immunity. Future studies analyzing the whole genome-wide expression of ISGs should further define the molecular basis of this important host defense pathway against DENV and other important viruses. This work was supported by National Institutes of Health Grants U01 AI082185 and U54 AI057157 from the Southeast Regional Center of Excellence for Emerging Infections and Biodefense and National Institute of Allergy and Infectious Diseases Contract HHSN272200900042C. The PCR array data presented in this article have been submitted to the National Center for Biotechnology Information's Gene Expression Omnibus (http://www.ncbi.nlm.nih.gov/geo/query/acc.cgi?acc=GSE49871) under accession number GSE49871.
. 2010. Dengue: a continuing global threat. Nat. Rev. Microbiol. 8(Suppl): S7–S16.
. 2006. The WHO dengue classification and case definitions: time for a reassessment. Lancet 368: 170–173.
. 2011. Important advances in the field of anti-dengue virus research. Antivir. Chem. Chemother. 21: 105–116.
. 2004. Interferon-dependent immunity is essential for resistance to primary dengue virus infection in mice, whereas T- and B-cell-dependent immunity are less critical. J. Virol. 78: 2701–2710.
. 2012. Gamma interferon (IFN-γ) receptor restricts systemic dengue virus replication and prevents paralysis in IFN-α/β receptor-deficient mice. J. Virol. 86: 12561–12570.
. 2010. Enhanced infection of liver sinusoidal endothelial cells in a mouse model of antibody-induced severe dengue disease. Cell Host Microbe 7: 128–139.
. 2006. Murine model for dengue virus-induced lethal disease with increased vascular permeability. J. Virol. 80: 10208–10217.
. 2005. Critical roles for both STAT1-dependent and STAT1-independent pathways in the control of primary dengue virus infection in mice. J. Immunol. 175: 3946–3954.
. 2011. STAT2 mediates innate immunity to Dengue virus in the absence of STAT1 via the type I interferon receptor. PLoS Pathog. 7: e1001297.
. 2009. Cardif-mediated signaling controls the initial innate response to dengue virus in vivo. J. Virol. 83: 8276–8281. 2008. Distinct RIG-I and MDA5 signaling by RNA viruses in innate immunity. J. Virol. 82: 335–345.
. 2006. IRFs: master regulators of signalling by Toll-like receptors and cytosolic pattern-recognition receptors. Nat. Rev. Immunol. 6: 644–658.
. 2008. Interferons and viruses: an interplay between induction, signalling, antiviral responses and virus countermeasures. J. Gen. Virol. 89: 1–47.
. 2009. A protective role for dengue virus-specific CD8+ T cells. J. Immunol. 182: 4865–4873.
. 2007. Cell-specific IRF-3 responses protect against West Nile virus infection by interferon-dependent and -independent mechanisms. PLoS Pathog. 3: e106.
. 2000. IP-10 is critical for effector T cell trafficking and host survival in Toxoplasma gondii infection. Immunity 12: 483–494.
. 2012. Trafficking and replication patterns reveal splenic macrophages as major targets of dengue virus in mice. J. Virol. 86: 12138–12147.
. 2008. Interferon regulatory factor IRF-7 induces the antiviral alpha interferon response and protects against lethal West Nile virus infection. J. Virol. 82: 8465–8475.
. 2006. Both CXCR3 and CXCL10/IFN-inducible protein 10 are required for resistance to primary infection by dengue virus. J. Immunol. 177: 1855–1863.
. 2012. Essential cell-autonomous role for interferon (IFN) regulatory factor 1 in IFN-γ-mediated inhibition of norovirus replication in macrophages. J. Virol. 86: 12655–12664.
. 2012. Interferon response factors 3 and 7 protect against Chikungunya virus hemorrhagic fever and shock. J. Virol. 86: 9888–9898.
. 2009. Induction of IFN-beta and the innate antiviral response in myeloid cells occurs through an IPS-1-dependent signal that does not require IRF-3 and IRF-7. PLoS Pathog. 5: e1000607.
. 2013. IRF-3, IRF-5, and IRF-7 coordinately regulate the type I IFN response in myeloid dendritic cells downstream of MAVS signaling. PLoS Pathog. 9: e1003118.